For those not familiar Slack, it is a collaborative working environment that also provides a chat service. It also offers native mobile apps for just about every platform out there. 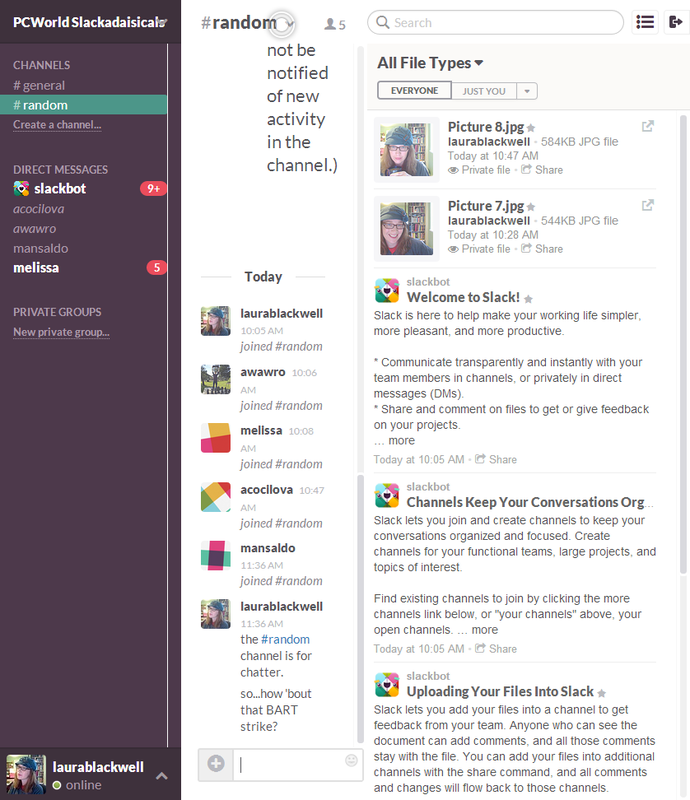 The basic slack structure is broken down into groups, channels, and private groups. You can be a member of multiple groups and each group can have a different login email yet still be accessible from the apps and web site with a single menu selection. Inside a group are channels that appear as hashtag channels. These channels are similar to chat rooms, but thanks to integration with Dropbox and Google Drive, channels also house all sorts of data and files related to the discussion. As a result, everyone has direct access to and context of the discussion. This alone will cut down on the back and forth of email. The group administrator can create private channels that are by invite only. This is a great feature for anyone who invites outside collaboration. 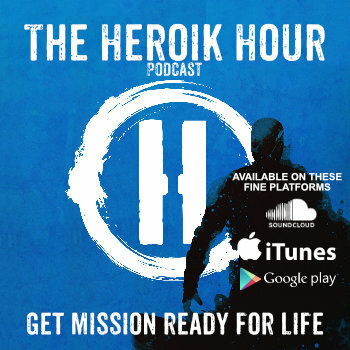 In the Heroik Innovation Lab (HIL), we collaborate with different individuals and some business-y topics we keep close to chest. This “Private Groups” feature makes that really easy to do. Structuring the channels is completely up to you. For example, some teams structure their channels for different aspects of project development (design, biz dev, etc.). We have a watercooler/lobby for random and idle chat, and several channels dedicated to specific long-term projects and Heroik Initiatives. Each channel is it’s own message board. Messages are associated with the channel they are posted on, but files can be associated on multiple channels. Starring messages, marks them as favorites and makes them easily accessible in the sidebar. This is helpful when you want to refer back to essential instructions, key statements, etc. The posts themselves are almost instant. There’s a slight delay in dialog but it’s no different than the delay on a phone call. All of the files and images are displayed chronologically inline as well, making them easy to spot. All files uploaded or referenced also appear in the sidebar for quick location and use. This includes any service that you’ve integrated like Dropbox or Google Drive. If you’re an emoji fan, you’ll find plenty to choose from built in to slack. I rarely use them and most often see them appear by accident/automated conversion :P.
There are plenty of options to manage notifications and turn off notifications by email if need be. So rejoice if email notifications bother you. Another cool feature of messages in Slack is the ability to edit and delete previous messages. You can go back in time and refine or remove your comments. The native desktop apps (Mac/Win) and web apps both support drag and drop files into the window to upload it to Slack. Uploaded files are tagged to the current channel for easy browsing but users are also presented with a complete list of available files. These aren’t just links. The contents of documents and PDFs are indexed for searching. This is a very useful feature. Pasting in a link to a Google Doc renders the document searchable within Slack. You can also filter searches by file type and favorite (starred) status. 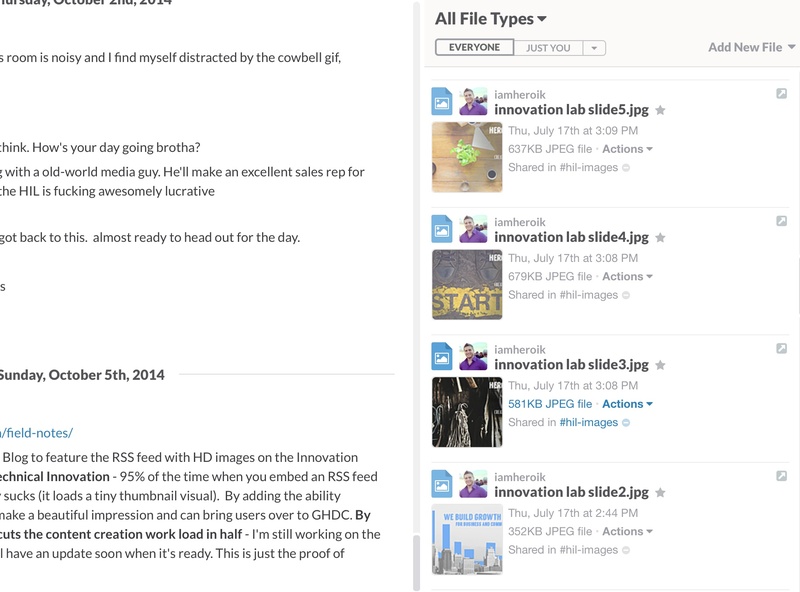 Each file has it’s own comment thread which is great for collaboration. Think of this like a folder that contains the document and the comments and stickies you place upon it as it works its way through the process. We also use the commenting and editing system directly in Google Docs, but this is convenient to discussing big picture items, goals and intentions. The comments also make a great reference for reviewing changes. The search function in Slack is awesome, fast and extensive. Finding files is easy, as you’d expect, but finding specific conversation threads is even easier. Search results include not just the phrase or word match but a few of the messages above and below the match. This ensures you’re given context into what may be stale or forgotten conversations. Even with a file search you are given all the contextually relevant bits. We’ve been using Slack for a year on various Android devices, iPhone 4 and 5s, (and now the iPhone 6), Macs and PCs. The apps work tremendously well and reflect the robust features found on the web version. Slack has a freemium model. The FREE account is of course limited and includes, a maximum of 10,000 messages stored in the archive, a maximum of 5GB of file storage and a maximum of 5 integrations. 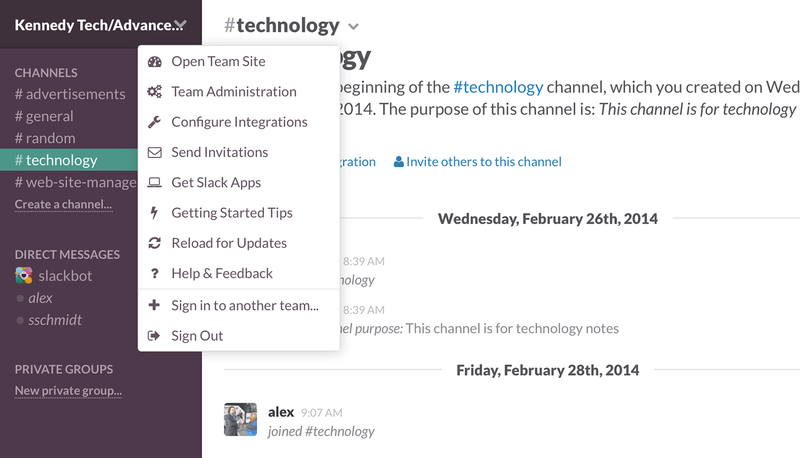 Anything you post to Slack is private to your team by default. Viewing the communications and files within any team requires user authentication. 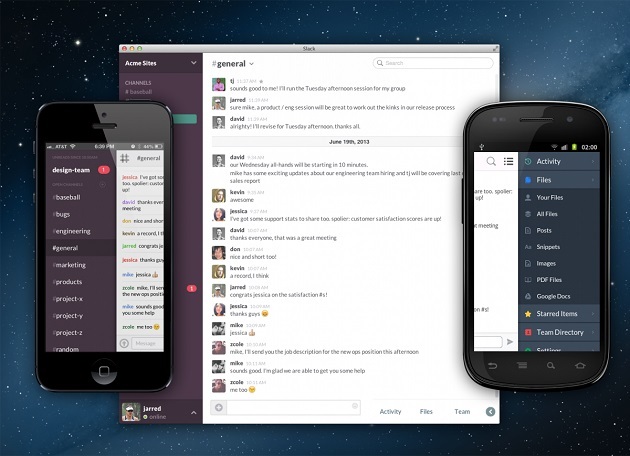 Slack is one of the best services we’ve used in the past year. Not only does this rally the team in a great work environment, it’s an excellent way to build culture with a distributed team full of people who are always on the go. They have a free plan that is great to start a pilot for your biz. If you signup through this link by November 15th, you’ll get a $100 credit toward the costs. Copyright 2019 Heroik Media. All Rights Reserved.